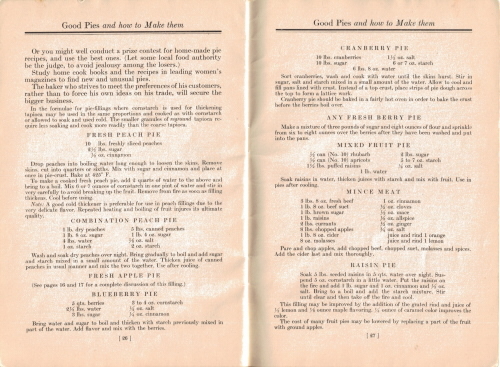 Here are pages 24, 25, 26, 27, 28, 29, 30 and 31 of the vintage recipe booklet “Good Pies & How To Make Them” that was published in 1928 by Crisco. 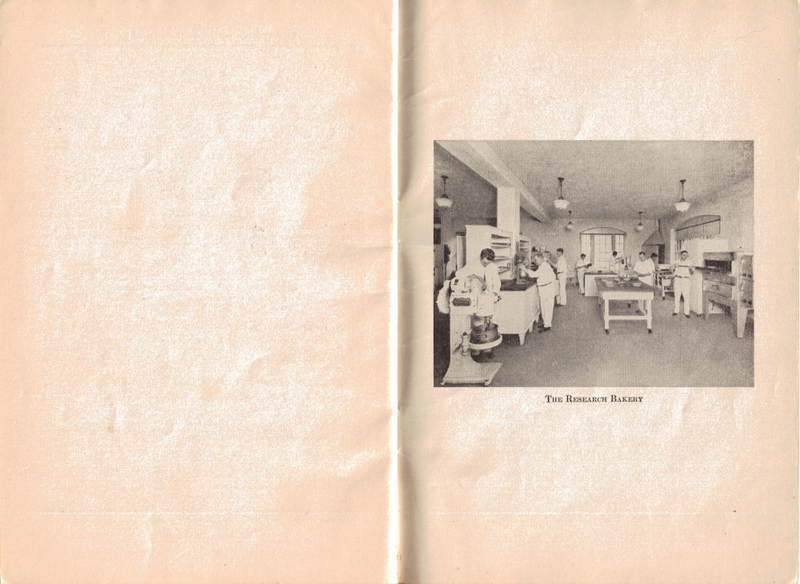 Pages 24 and 30 are blank, page 31 is just a picture of Crisco’s Research Bakery. 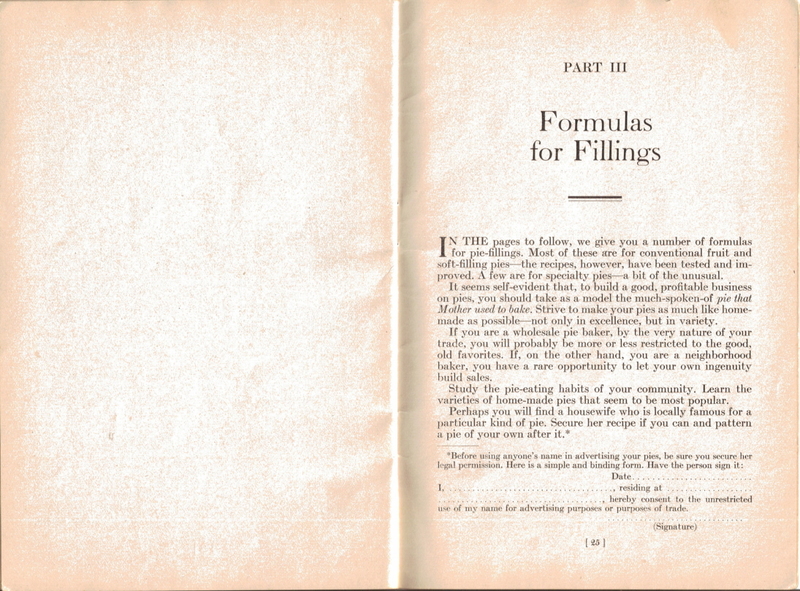 In the pages to follow, we give you a number of formulas for pie-fillings. 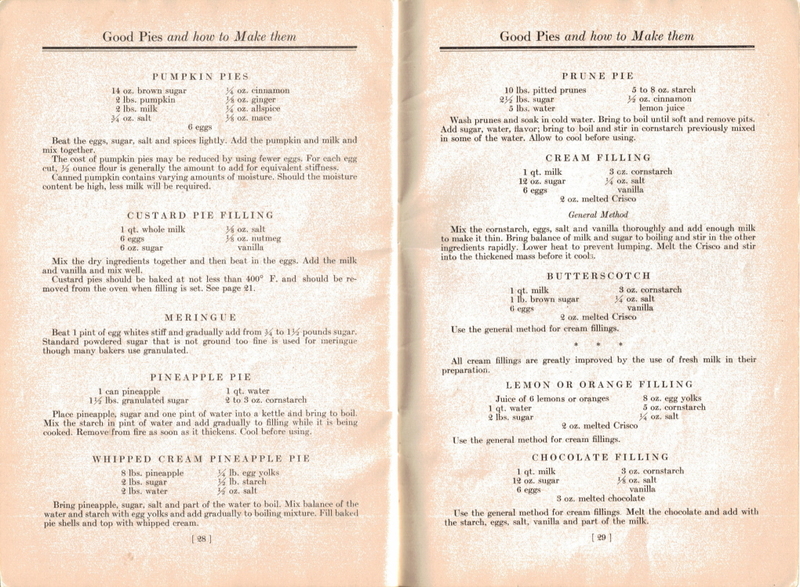 Most of these are for conventional fruit and soft-filling pies–the recipes, however, have been tested and improved. A few are for specialty pies–a bit of the unusual. 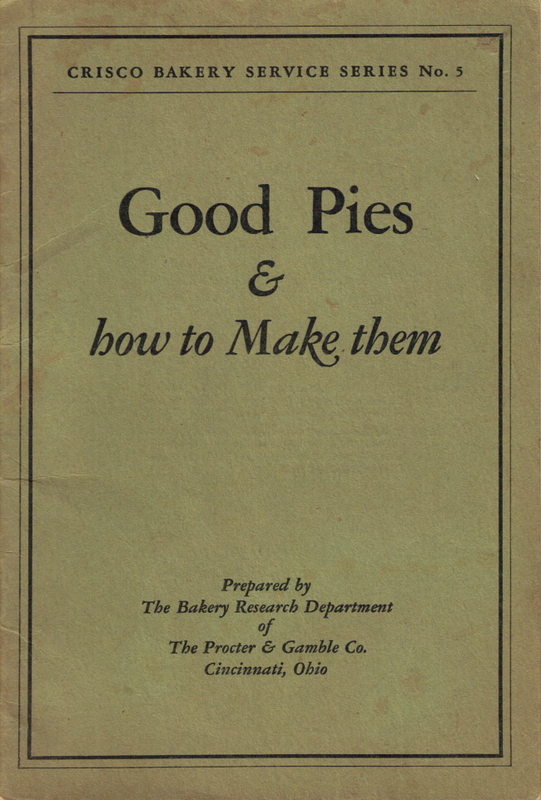 It seems self-evident that, to build a good, profitable business on pies, you should take as a model the much-spoken-of pie that Mother used to bake. Strive to make your pies as much like homemade as possible–not only in excellence, but in variety. If you are a wholesale pie baker, by the very nature of your trade, you will probably be more or less restricted to the good, old favorites. If, on the other hand, you are a neighborhood baker, you have a rare opportunity to let your own ingenuity build sales. Study the pie-eating habits of your community. Learn the varieties of home-made pies that seem to be most popular. I, . . . . . . . . . . . . . . . . . . . . . . . . . , residing at . . . . . . . . . . . . . . . . . . . . . . . . . . . .
. . . . . . . . . . . . . . . . . . . , hereby consent to the unrestricted use of my name for advertising purposes or purposes of trade. 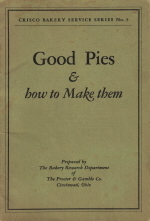 Study home cook books and the recipes in leading women’s magazines to find new and unusual pies. The baker who strives to meet the preferences of his customers, rather than to force his own ideas on his trade, will secure the bigger business. 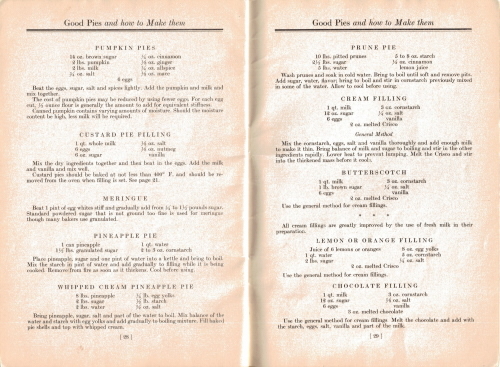 In the formulae for pie-fillings where cornstarch is used for thickening tapioca may be used in the same proportions and cooked as with cornstarch or allowed to soak and used cold. The smaller granules of reground tapioca require less soaking and cook more readily than the coarse tapioca. Drop peaches into boiling water long enough to loosen the skins. Remove skins, cut into quarters or sixths. Mix with sugar and cinnamon and place at once in pie-crust. Bake at 425° F.
To make a cooked fresh peach pie, add 2 quarts of water to the above and bring to a boil. Mix 6 or 7 ounces of cornstarch in one pint of water and stir in very carefully to avoid breaking up the fruit. Remove from fire as soon as filling thickens. Cool before using. Note: A good cold thickener is preferable for use in peach fillings due to the very delicate flavor. Repeated heating and boiling of fruit injures its ultimate quality. Wash and soak dry peaches over night. bring gradually to boil and add sugar and starch mixed in a small amount of the water. Thicken juice of canned peaches in usual manner and mix the two together. Use after cooling. Bring water and sugar to boil and thicken with starch previously mixed in part of the water. Add flavor and mix with the berries. Sort cranberries, wash and cook with water until the skins burst. Stir in sugar, salt and starch mixed in a small amount of the water. Allow to cool and fill pans lined with crust. Instead of a top crust, place strips of pie dough across the top to form a lattice work. Cranberry pie should be baked in a fairly hot oven in order to bake the crust before the berries boil over. Make a mixture of three pounds of sugar and eight ounces of flour and sprinkle from six to eight ounces over the berries after they have been washed and put into the pans. Soak raisins in water, thicken juices with starch and mix with fruit. Use in pies after cooling. Pare and chop apples, add chopped beef, chopped suet, molasses and spices. Add the cider last and mix thoroughly. Soak 5 lbs. seeded raisins in 5 qts. water over night. Suspend 5 oz. cornstarch in a little water. Put the raisins on the fire and add 1 lb. sugar and 1 oz. cinnamon and 1/2 oz. salt. Bring to a boil and add the starch mixture. Stir until clear and then take off the fire and cool. This filling may be improved by the addition of the grated rind and juice of 1/2 lemon and 1/8 ounce maple flavoring. 1/4 ounce of caramel color improves the color. 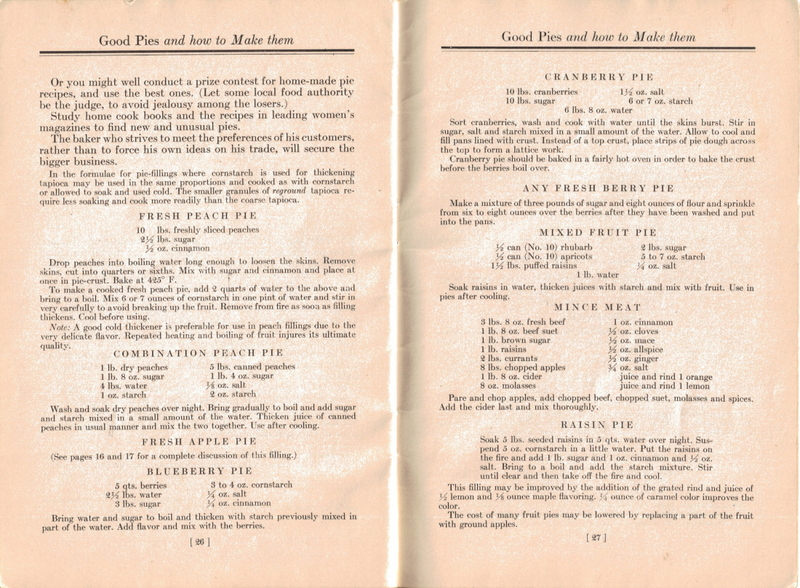 The cost of many fruit pies may be lowered by replacing a part of the fruit with ground apples. Beat the eggs, sugar, salt and spices lightly. Add the pumpkin and milk and mix together. The cost of pumpkin pies may be reduced by using fewer eggs. For each egg cut, 1/2 ounce flour is generally the amount to add for equivalent stiffness. Canned pumpkin contains varying amounts of moisture. Should the moisture content be high, less milk will be required. Mix the dry ingredients together and then beat in the eggs. Add the milk and vanilla and mix well. Custard pies should be baked at not less than 400° F. and should be removed from the oven when filling is set. See page 21. Beat 1 pint of egg whites stiff and gradually add from 3/4 to 1 1/2 pounds sugar. Standard powdered sugar that is not ground too fine is used for meringue though many bakers use granulated. Place pineapple, sugar and one pint of water into a kettle and bring to boil. Mix the starch in pint of water and add gradually to filling while it is being cooked. Remove from fire as soon as it thickens. Cool before using. Bring pineapple, sugar, salt and part of the water to boil. Mix balance of the water and starch with egg yolks and add gradually to boiling mixture. Fill baked pie shells and top with whipped cream. Wash prunes and soak in cold water. Bring to boil until soft and remove pits. Add sugar, water, flavor; bring to boil and stir in cornstarch previously mixed in some of the water. Allow to cool before using. Mix the cornstarch, eggs, salt and vanilla thoroughly and add enough milk to make it thin. Bring balance of milk and sugar to boiling and stir in the other ingredients rapidly. Lower heat to prevent lumping. Melt the Crisco and stir into the thickened mass before it cools. Use the general method for cream fillings. All cream fillings are greatly improved by the use of fresh milk in their preparation. 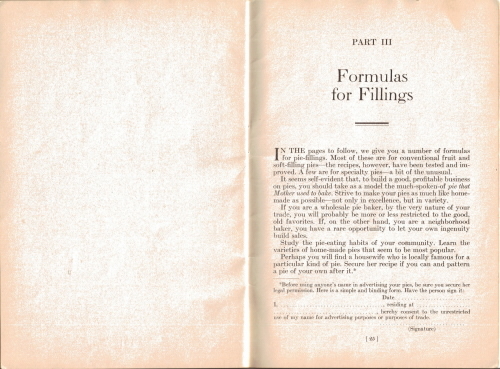 Use the general method for cream fillings. Melt the chocolate and add with the starch, eggs, salt, vanilla and part of the milk.